Replacement Strain Gauge S-Type Load Cells are in stock and ready for fast shipment to you when you need them. These load cells get their name from their "s" shape. S-Type cells provide an output under tension pull. Applications for S Beams include hanging, tank level, hoppers and truck scales. We stock a huge number of these tension measurement transducers from the top brands in the industry like CAS, Celtron, Artech, Rice Lake, Revere, Transcell Technology and many more. Please contact us if you need a particular model number or capacity. Odds are we can get it for you and if not there is a very good chance we can get an interchangeable s-beam load cell for you that will meet the exact specifications of the original model you requested. Contact us for your replacement load cells today. 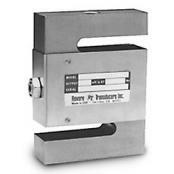 Revere S-beam load cell with a compact and economical design and constructed of stainless steel. Ideally suited for scale conversions and general-purpose weighing. NTEP-certified capacities from 100 to 10,000 lb (45.4 to 4535.9 kg); non-NTEP capacity of 50 lb (22.7 kg). Includes 20?/6.1 m of load cell cable. The trimmed output simplifies installations. 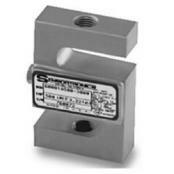 S-type load cell with a compact and economical design. Ideally suited for scale conversions and general-purpose weighing. NTEP-certified capacities from 100 to 10,000 lb (45.4 to 4535.9 kg); non-NTEP capacity of 50 lb (22.7 kg). Includes 20'/6.1 m of load cell cable. Sensortronics 60001 S-Beam, Alloy Steel, IP67 load cell single or multiple cell tension load applications. Nickel plated, high-alloy steel construction. Integral 20' cable and full environmental protection with stainless steel side plates. Capacities from 25 to 20,000 lb.